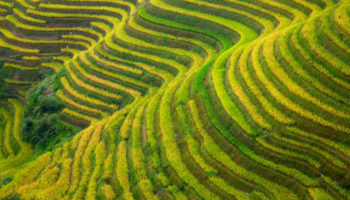 Hong Kong is a myriad of islands on the southwest coast of China. 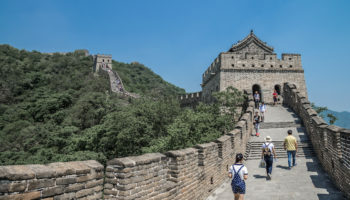 It was a British territory for more than a century before being handed back to China recently. It’s a culturally diverse city with a rich history and a taste for modern architecture and electronics. 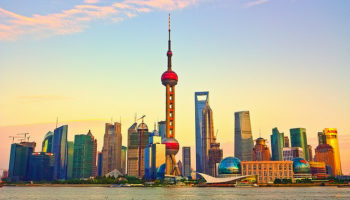 You can still see the ancient roots of the city through the towering, shimmering skyscrapers. Traditions are carried on inside ancient temples, in the street food hawked by vendors and in proud flag ceremonies. It’s as if you can find the oldest parts of the city on street level with Hong Kong growing more modern with the height of its buildings. It’s a plentiful place, especially in people. Parts of Hong Kong have the highest population density in the world. 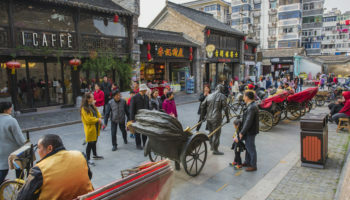 But the mixture of cultures and the blending of old and new make this city vibrant and unique. In fact, the food in Hong Kong benefits from this fusion and is some of the best in the world. 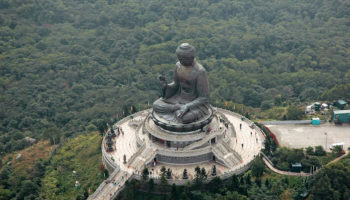 Asia’s World City is such a rich tapestry of flavors, sights and sounds, so be sure to choose a place to stay in Hong Kong that reflects your unique tastes. Split in two by the iconic Victoria Harbour, Hong Kong Island and Kowloon on the mainland are the two integral parts of Hong Kong and between them contain the most interesting neighborhoods and almost all the hotels. Central District is the place to see and be seen in Hong Kong. This crammed district is marked by high-end restaurants, luxury hotels and towering high-rise buildings. It is the commercial and cultural center of the city. Central provides your best opportunity to see a celebrity in the wild. 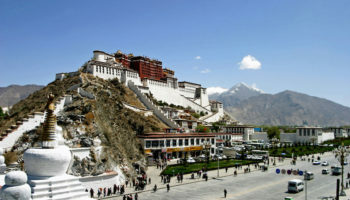 Although hotel choices in Central are limited to the upper range, staying here makes you feel like a resident yourself. Dress up nice to enjoy Central’s nightlife. It’s the best in the city. Known for its raucous taverns, swanky nightclubs, lavish wine bars and trendy restaurants, Central is best to visit when the sun sets. Be prepared to spend a few dollars as the nightlife in Hong Kong can be expensive. But Central is more than just high-end establishments. You can also pop over to the beautifully green Hong Kong Park for a walk, or spend an afternoon at the Zoological and Botanical Gardens. No trip to Hong Kong is complete without a visit to the urban heart of the metropolis. Conrad Hong Kong – Conrad Hong Kong features simply stylish and contemporary rooms that boast sweeping views of Victoria Harbor and Victoria Peak. In terms of amenities, the hotel has a selection of dining options – including one particularly sophisticated, award-winning restaurant. Staying here means you can keep up with your workouts in the fitness center or unwind in the luxury spa. The hotel itself is connected to the high-end shopping center, the Pacific Place. JW Marriott Hotel – With its lobby boasting floor to ceiling windows and featuring views of Hong Kong’s skyscrapers, there are various dining options to choose from at this branch of JW Marriott. You’ll find a high-end health club and heated outdoor pool to enjoy. 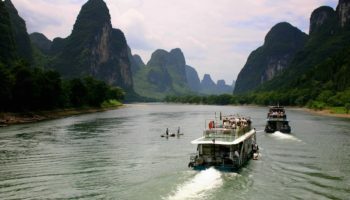 Rooms feature views of either the mountainside or Victoria Harbor and come with thick, comfortable mattresses, pillow menus, and marble bathrooms. It sits at the top of the Pacific Place complex. Hong Kong can be overwhelming, but Sheung Wan serves as an escape. Just to the west of the city’s main business district, Sheung Wan has more of a laidback feel than the rest of the city. But don’t be fooled — Sheung Wan is still very lively. It just has a more down-to-earth feel. The winding streets of this neighborhood are charming and are great for getting lost for an afternoon. You’ll find plenty of authentic eateries on the ancient streets where you can chow down for as long as you’d like. 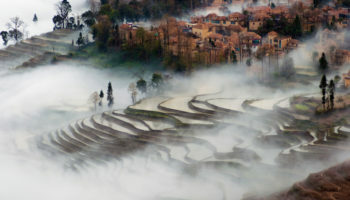 You’ll also find the ferry to Macau in this coastal district. The streets near the port bustle with the energy of tourists and day-trippers, but it’s where you’ll find the Western Market. This 1906-built four-story building is less of a market and more of a preserved building. If you’re looking for a unique market, head to the Dried Seafood or Medicine Markets where you can pick up dried scallops or raw ginseng. The Jervois – This 5-star option is all about simply sophisticated interiors, shiny surfaces, marble floors, and custom furnishings by a French designer. There are various suites to choose from, accessible by private lifts. Each room comes with a smartphone, which you can use to make long distance calls, amongst other things. There are laundry facilities and a gym on offer. 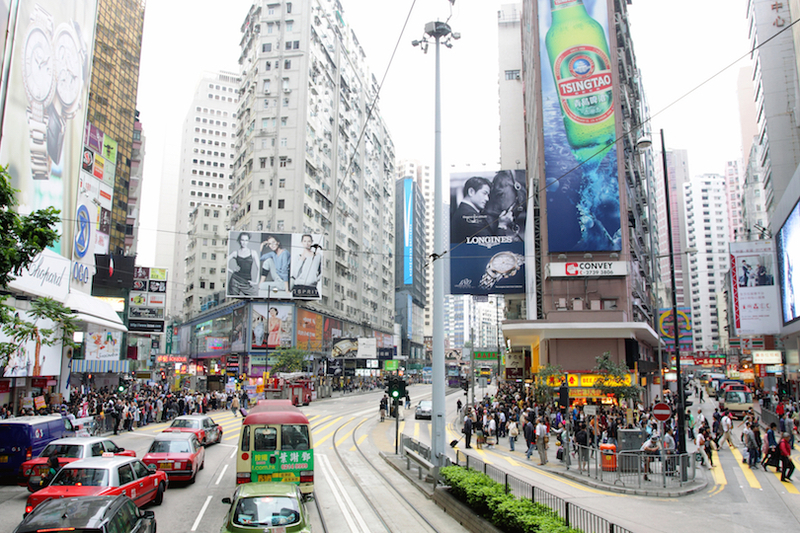 Nearby, there’s an MTR station, as well as all the nightlife of the Lang Kwai Fong and Soho areas to enjoy. iclub Sheung Wan Hotel – A towering, contemporary hotel close to an MTR station, this hotel is also nearby the Western Market. Guests will first be greeted by a large, futuristic style lobby. The bedrooms are decorated with a pure white color scheme, which allows the city views to take center stage. There’s a 24-hour fitness center to enjoy here. Location-wise, this hotel is in easy reach of Soho and the cool Mid-levels Escalator. Ibis Hong Kong Central – This 3-star hotel is set right in the middle of Hong Kong’s commercial district, less than 10 minutes from the nearest MTR station. It’s also close to Macau Ferry Terminal. Some of the rooms at this branch of Ibis are simple, with white linen, wooden floors, and utilitarian furnishings. Others are based on the theme of Old Hong Kong. There’s a breakfast buffet to enjoy at the hotel restaurant, plus a bar. Views across the water are breathtaking. South of Hollywood Road near Central, you’ll find SoHo; hence the name. This is the entertainment heart of Hong Kong. It is technically a part of Central, but it is worth a visit all on its own. SoHo is full of intriguing shops, delicious street foods and authentic dim sum. Head down to the Cat Street Market to pick up a souvenir, You can argue with your travel mates about the origin of the name. Is it for cat burglars? Prostitutes? Pirates? Ask any of the vendors and they’ll all have a different explanation. Pick out the one that you find most intriguing. You can also head over to the Mid-Level Escalators that take you from SoHo to Central and back. These impressive escalators were built in the 90’s to alleviate congestion in the city and they are marvelous. Just don’t get caught. The escalators only run one-way depending on the time — down in the morning and up in the evening. Hotel Madera Hollywood – Featuring an eclectic mix of vintage style interiors, and colorful, creative designs, this fashionable hotel reflects the vibrancy of the city. The different suites on offer boast seating areas and lounges, for all the homely comforts you could ask for in the city. To keep up with your workouts, there’s a fitness center for guests to use. 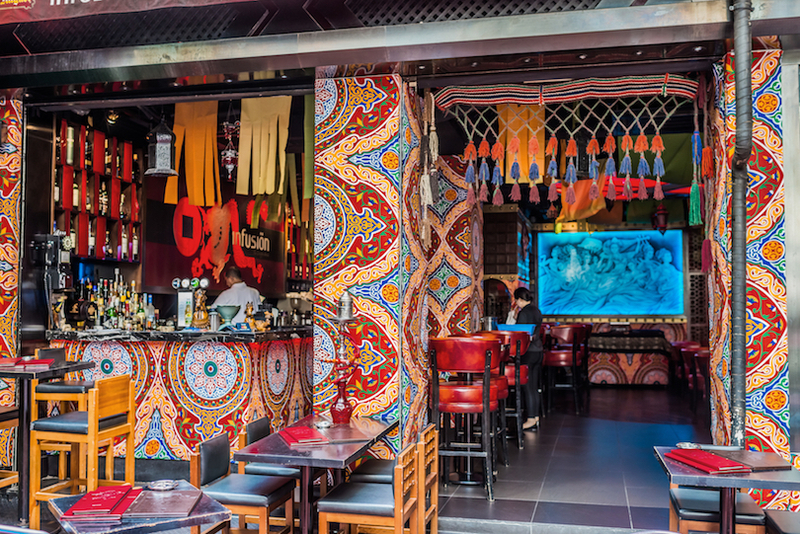 Wan Chai is much more than a couple of blocks of girlie-bars populated by drunken American sailors; after all, the World of Suzie Wong was just a work of fiction set in Wan Chai during a bygone age. This is the place to visit when you want to buy something specific. 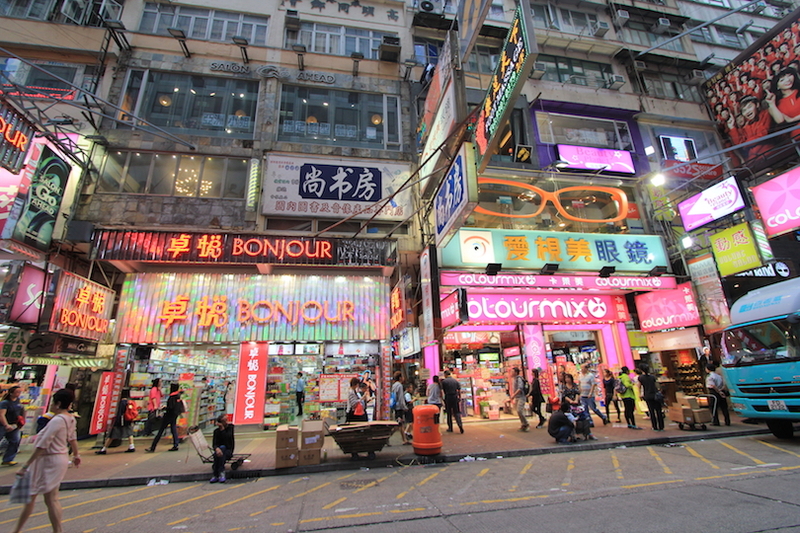 Unlike many other neighborhoods in Hong Kong, Wan Chai has specific streets that specialize in specific products. You can head to Tai Yuen Street for interesting Asian toys, Queen’s Road East for exotic antiques and Wan Chai Computer Centre for electronics. This small commercial area is packed with office workers. At lunch, they all descend on the many quick noodle restaurants and street food stalls. And where there are white-collar workers, there are bars for happy hour. Lockhart Road is the place to have a late afternoon drink and to rub elbows with the locals. 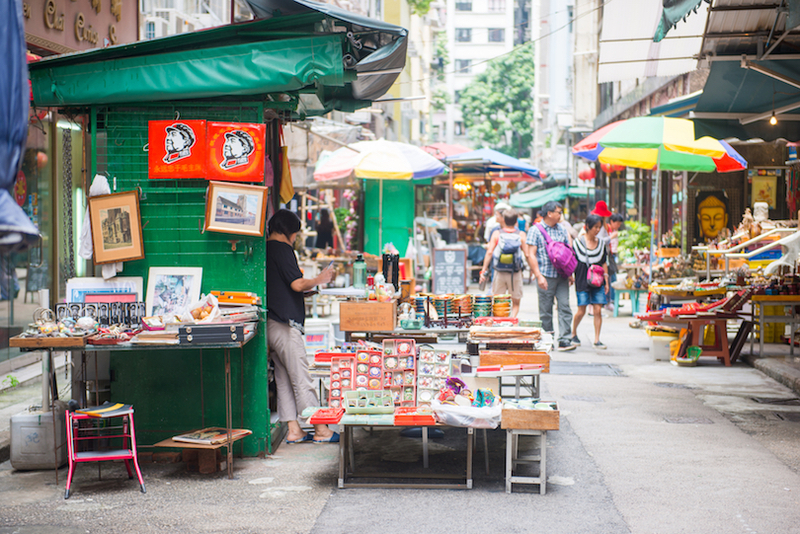 There’s plenty of culture to be found in Wan Chai. Head over to Golden Bauhinia Square for a daily flag-raising ceremony. 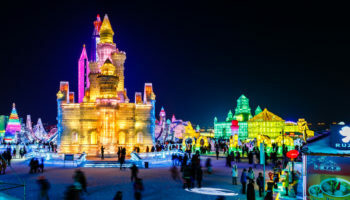 If you’re there on July 1st (Handover Anniversary) or October 1st (National Day of China), you’ll be in for an ornate treat. The district also boasts the Hung Shing Temple, Old Wan Chai Post Office and Pak Tai Temple. Renaissance Harbor View Hotel – As you might be able to tell by the name, this 5-star hotel boasts amazing views of Victoria Harbor. The view is especially spectacular from the hotel’s award-winning restaurant. It’s a fantastic choice for people who want to enjoy high-end comforts. There’s a large outdoor swimming pool next to the water’s edge, surrounded by palm trees, as well as a selection of dining options. The rooms are luxurious and boast marble bathrooms. Wanchai 88 Hotel – Wanchai 88 Hotel features soft, natural colors throughout, with wood paneling and subtle, stylish decoration. Magnificent city views abound. The rooms are spacious and the bathrooms feature rain showers. In terms of location, this is a fantastic option if you want to get around Hong Kong using the MTR; it’s just a hop, skip and a jump to Wan Chai MTR station. Causeway Bay is where you go to buy stuff. 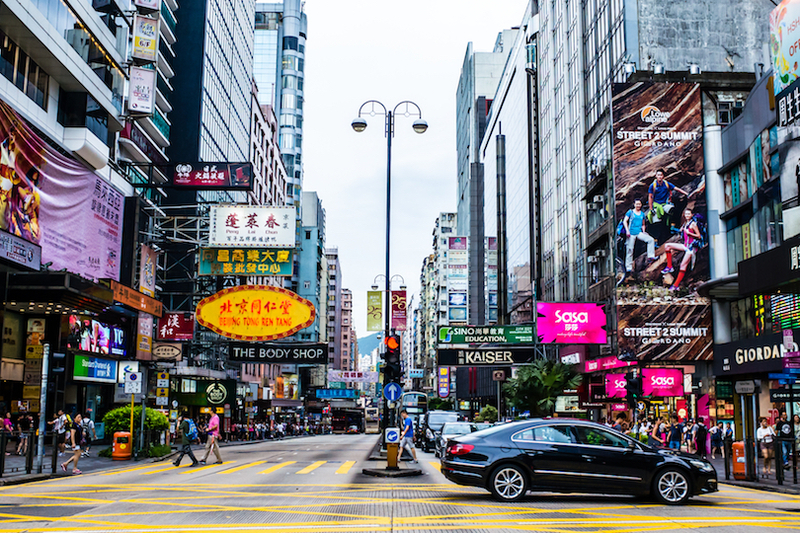 Hong Kong is famous for its incredible deals on electronics, but you need to decide which side of this district to visit for the best deals. The western end is packed full of high-end shopping malls, boutique and department stores. The eastern end is for the bargain hunters as local street vendors hawk their wares for a negotiable price. Once you get done with your shopping, you’ll want to calm down. Head on over to Victoria Park where you can partake in public Tai Chai sessions. Or you can head over to the district’s historic Hong Kong Central Library where you can ogle at ancient collections. The neighborhood even has a Hong Kong version of Time Square. It’s not as big as New York’s, but it is definitely worth checking out when you’re in the area. And when you get hungry, make sure to take a stroll down Houston Street. Otherwise known as food street, it is lined with local street food vendors. Metropark Hotel Causeway Bay – With a fantastic rooftop pool where guests can enjoy swimming with views of the waterfront, this 4-star hotel is close to Victoria Park. 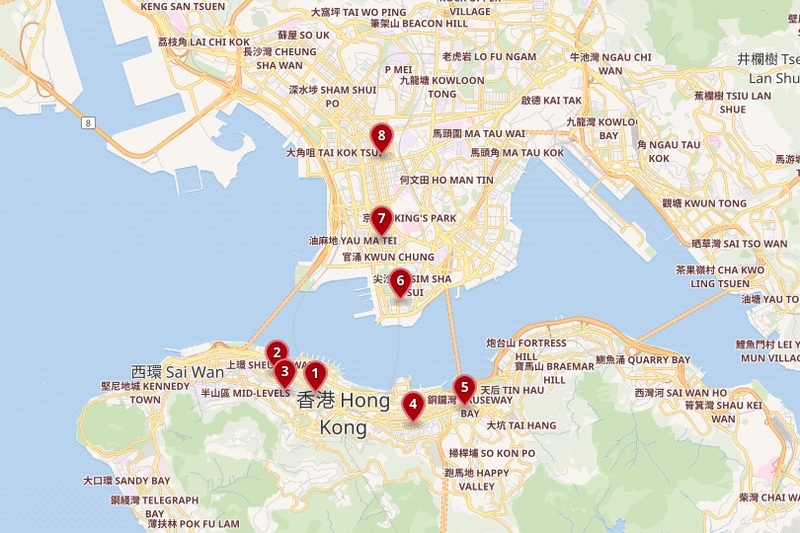 The nearest MTR station is in easy walking distance. There’s a pub on site – which often has live music performances – and a stylish, open-kitchen concept restaurant. The rooms are spacious and decked out with contemporary furnishings and calm, neutral colors. There’s also a gym where you can work out with city views. L’hotel Causeway Bay Harbor View – The rooms here boast nice design details like curved wooden furnishings, parquet floors and plenty of natural light. Some even come with stylish baths and amazing curving windows that overlook Hong Kong’s skyscraper-clad skyline. There’s a delicious buffet breakfast served up each morning and a variety of food on offer in the restaurant, too. 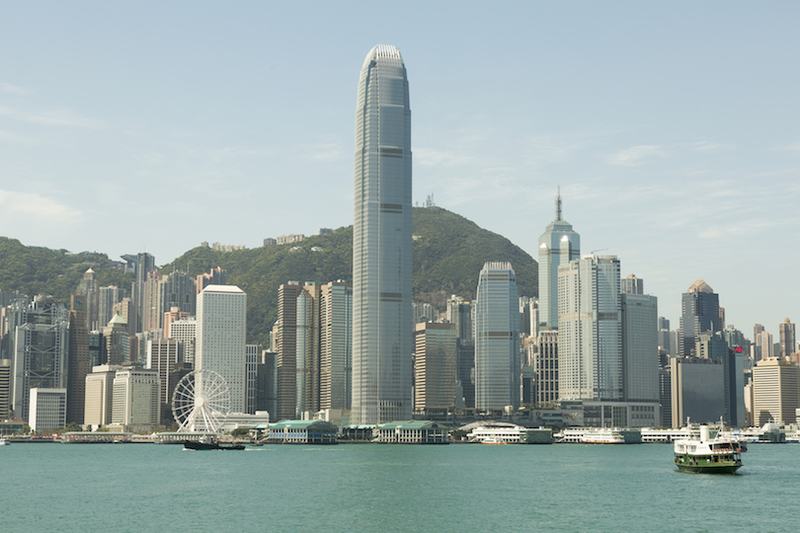 Head down to Tsim Sha Tsui at the southern tip of Kowloon Peninsula for beautiful views of Hong Kong’s skyline. The best view is from Victoria Harbour’s Promenade at the Avenue of Stars. It makes for a nice little romantic getaway. Tsim Sha Tsui is where most tourists stay and spend their money, since it has the greatest concentration of hotels, restaurants, and shops. Weird little local shops and authentically local restaurants and cafes pack Nathan Road which rocks neon lights to rival Las Vegas. Incredibly modern shopping malls dot Canton Road, but you can escape all the big-city bustle at Kowloon Park where you can take a relaxing stroll through abundant greenery. 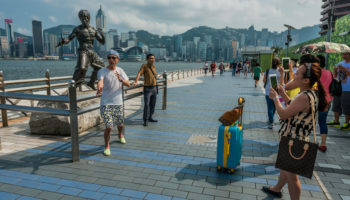 If you’re looking for a little culture in this Kowloon neighborhood, head over to the Tsim Sha Tsui Ferry Pier where they’ve been shuttling passengers since the late 1800’s. Big-name musicians put on concerts at the Hong Kong Cultural Center where you might catch dance, drama or opera shows. Hotel ICON – This luxury hotel has been designed by local architects for a trendy and chic place to stay in Hong Kong. There’s an array of interesting design details that will delight anybody with an eye for style. Hotel ICON’s harbor views are the best from its rooftop pool and bar. Plus, there’s a super impressive living wall going on in the lobby. Offering exceptional transport services, the hotel makes it easy for guests to explore the local area. Kowloon Shangri-La – There are an amazing seven dining options at this 5-star hotel; staying here means you’ll be spoilt for choice when it comes to what to have for dinner. The Kowloon Shangri-La is all about opulence, Hong Kong style. The silk carpets and marble finishings make things feel positively regal. The calm, warm rooms offer an oasis in the middle of the bustling city. Butterfly on Prat Boutique Hotel – True to its name, this boutique hotel is colorful and contemporary. It is a friendly place to stay and fantastic for families. In terms of dining options, there’s an Italian restaurant and Thai restaurant to enjoy onsite. The rooms at this 4-star hotel are filled with color and have carpets and floor to ceiling windows. 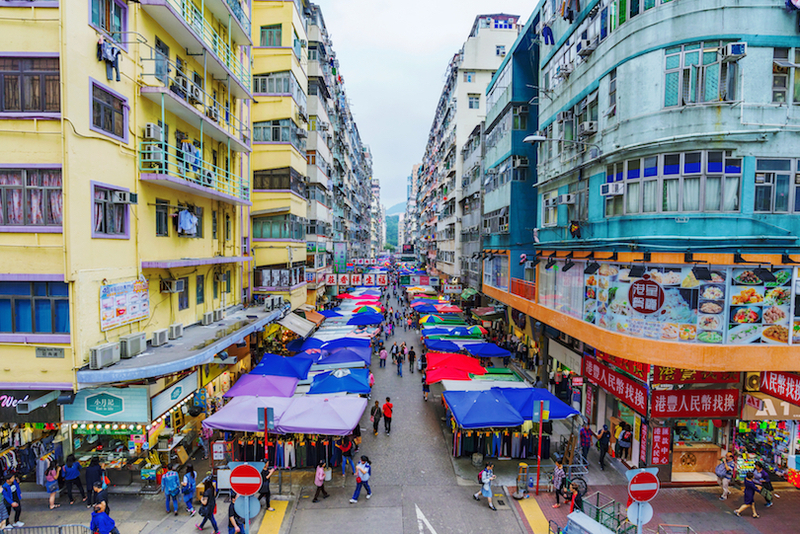 Hong Kong is a bustling and dynamic city, and it’s no more evident than in Jordan and Yau Ma Tei. This mixed residential and retail area is crackling with energy at any time of day. 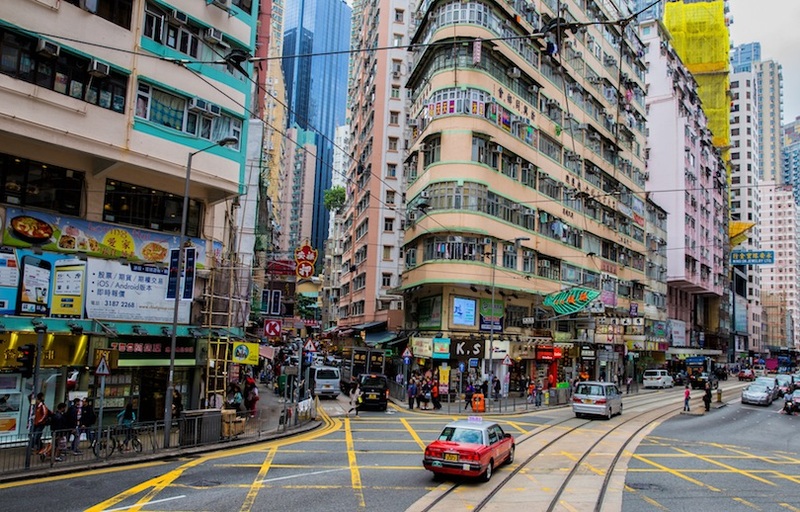 This is the neighborhood to go to if you are looking for authentic Hong Kong cuisine. The neighborhood is heavily residential and the restaurants all cater to a local clientele. The street merchants start to set up shop in the mid-morning. Jordan and Yau Ma Tei is famous for good luck charms carved out of green gemstones. They make wonderful souvenirs and you can feel free to barter for the best price. The district’s Broadway Cinematheque opens in the afternoon. This four-screen cinema hosts local film festivals and it’s your chance to check out an authentic Hong Kong movie. After a flick, head over to Temple Street for a night market where local vendors hawk authentic street food, electronics and clothing. And make sure to get your fortune told. Hotel Stage – The trendy Hotel Stage boasts minimalist and well-appointed rooms. Think a soft and subtle color palette and modern, on-trend furnishings. There’s a delicious breakfast served up each morning at the restaurant. There’s also a large conference center and a gym, so you can keep up with those workouts. In terms of things to do in the local area, the nearby Temple Street Night Market is the place to go for food and trinkets. Nathan Hotel – There’s a lot of understated style going on at Nathan Hotel, especially in the large rooms with a stripped back, luxurious feeling. These also come with smartphones, so guests can make international calls if they feel like it. There’s an onsite restaurant serving Cantonese food, as well as a bar that serves cocktails and Balinese dishes. Close by, there’s the busy Temple Street. 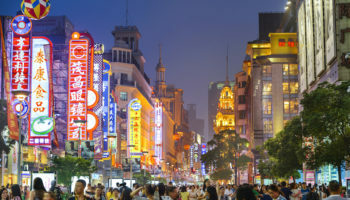 Being centrally located on Nathan Road means there’s a lot to eat, drink and buy in the immediate vicinity. Inn Hotel Hong Kong – Staying at Inn Hotel Hong Kong means being surrounded by all the buzz of the city, but back at the hotel, the rooms are compact and comfortable, decorated in light colors. The rooms higher up have great city views. Each room comes with tea and coffee facilities. Whilst this 3-star hotel doesn’t have any dining options of its own, the surrounding area is packed full of various restaurants to choose from. Mongkok is all about the markets. Narrow streets lead you through the Ladies Market and the Flower Market. Local vendors set up stalls full of clothing, accessories, flowers and jewelry. And, as always, you can negotiate the best price. Mongkok reflects the architecture of Hong Kong. It’s a mix of old and new buildings with commercial spaces on street level and residential apartments above. This bustling neighborhood is one of the most densely populated places on planet earth. And due to this critical mass, you can find just about anything in Mongkok. The neighborhood is buzzing with restaurants, shops, bars, nightclubs and massage parlors. It’s even been famously portrayed in films where triad gangs run its nightlife. This district holds onto its roots in street market stalls. There is a variety to choose from with each street having a different street market nickname. It’s a great place to sample some of Asia’s best street foods. Cordis Hotel – This is a towering hotel which truly does feature an incredible array of amenities. There’s a breathtaking ballroom, a very well equipped wellness center, a range of eating and drinking options, and – very handily – direct access to Mongkok MTR station and Langham Place Mall. The rooms at the Cordis Hotel are the ultimate in luxury, with high-end sophistication in terms of furnishings, soft carpets, rain showers, and sweeping views of the city. Metropark Hotel Mongkok – Recently renovated, the Metropark Hotel Mongkok features cozy bedrooms with traditional decor. There’s a cafe to chill out in a restaurant serving light meals and a bar. 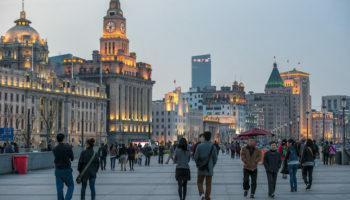 This 4-star hotel is a wonderful option if you want to be well connected on the Kowloon side of Hong Kong; the MTR and a bus stop are very close by. Ladies Market and the Goldfish Market are also within easy walking distance. Hotel 108 – Tastefully decorated with toned down teals and browns, this stylish hotel boasts a relaxing and calm environment to escape after a day of the hustle and bustle of Hong Kong’s streets. Some rooms at Hotel 108 even come with balconies to really soak up those city views. It’s a fantastic location; not only is this hotel surrounded by restaurants and food stalls, but the nearest MTR is 10 minutes’ walk away and a bus stop is very close by.